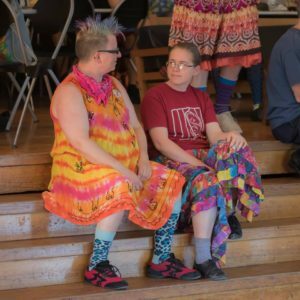 If there ever was a time and a place for a (gender neutral) contra dance, Sebastopol is it. 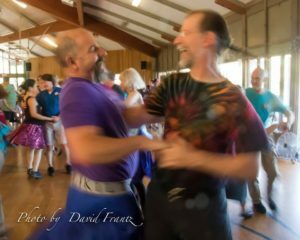 The town, home of apple processing facilities for many years, held a thriving contra dance when Apple was king. Now, the beloved Gravenstein is having a rebirth, and so has this contra dance, but with a twist. If you have been to the dance in the past you will notice a few changes. What will it look like? Gone are the terms Ladies and Gents, men and women. In their place the callers will say ” Take hands four from the top, ones cross over, make sure the person dancing the role of the Raven is on the Right.” What’s that? Ravens??? Well, in making this dance more welcoming to all individuals, we have to consider history of gender. Some people who considered themselves neither male or female, or who felt themselves inwardly the opposite gender from what they present, have had to fit into either Male or Female categories. You may have tried to rearrange a set of new dancers in the past that did not cross over when they were out at the top or bottom of the line. This dance will have individuals who choose to dance the role opposite of what they may physically present. There may be same gender couples. These same gendered couples may have heard: Which one is the Gent? Are you the girl? There is a simple mnemonic that we will learn: as a couple the Raven is on the Right and the Lark is on the Left. So, when you ask someone to dance, you ask: “What role would you like, Raven or Lark? If you are confused in the dance: “Are you the Lark? Do Ravens alemande by the left? In the past some dances have put out aprons for men dancing the Raven role, and neckties for women dancing the Lark. These traditional gender signifiers wont be in the room, unless some dancer has just rushed out of the kitchen or board room and didn’t have chance to change clothes. It may be disorienting for some dancers, (remember the first time you had to negotiate the end effects of a complex dance?) but we think that making a dance that is welcoming to all will be just the ‘Apple a Day’ we all need. Every 4th Saturday beginning January 27th, 8:00-10:30 PM at Wischemann Hall Sebastopol. Sliding Scale: Pay What You Can. No One Turned Away For Lack of Funds. (PWYC-NOTAFLoF) New dancers encouraged to arrive 30 minutes early to get some basics.